Our blog aims to provide useful guides on how to make the most of VZY products, as well as news and information from across the web. Recently, I attended a day course about using LinkedIn for business run by the Local Enterprise Office. This course looked at your personal page and your business page. I am familiar with LinkedIn and have a personal page that I try to keep updated and informative. The company business page does exist but is a little sparse and needs a face lift. The course looked into building up your friends or connections and how useful these new found “friends” can be. The lecturer, Noel Davidson, stressed that it is not about adding everyone in mass and having thousands of connections but about the type of people you connect with – quality not quantity. We also looked at joining groups that concern your type of business or your own hobbies. There are two different types of groups – Open and Closed. Closed groups are monitored and you must ask the moderators to join whereas open groups are the opposite and you are free to come and go.Groups can be very useful in business and with personal pages as they can be used for discussions, promotions, jobs (advertising and seeking) and marketing research. We also spoke about posting and what kind of content to post. This was the part I was very interested in as when you are posting out to the masses under the company name, it needs to be interesting and relevant. Noel spoke about the 80 – 20 rule. 80% general posting and 20% about your business as you don’t want to spam people with “look at us aren’t we wonderful” posts. This is something that I was not aware of, I understand not to boast about your business but before the course I was convinced I must always be posting about our business and projects we are doing. Noel has found that “Givers Get” and what he means by that is posting interesting articles about general topics makes your more informative and approachable. LinkedIn can be a great promotional tool. It is free and manned by you. It is very simple to use and is laid out well. Once you have dressed your personal or business profile well you are a “click away from business”. This shows that by representing yourself well online new business could be just around that social media corner. This is my task – to take on the Business page using my new skills in LinkedIn to make the Visual ID business page into a beacon of Knowledge and Connections! Some time ago, one of our clients asked me to put together a location map for a chain of hardware stores in county Tipperary, to appear on a new website. I was given a bunch of business cards with the relevant contact details. When I finally got around to do some work on the map, I discovered that these details consisted of nothing more than phone numbers and email addresses alongside the name of the town in which each store is located. Thinking that visitors of the new website might want a slightly more accurate location than Google’s perceived town centre of “Thurles” or “Roscrea”, I asked my client to come back with an actual address for each store. This time, I was given a list with addresses such as “Cahir Road, Cashel” and “Templemore Road, Thurles”. Looking at Google’s map of Cashel, I see that the Cahir Road stretches for 1.5 kilometres from the centre of town to the M8 motorway on the outskirts, hardly a pinpoint location. 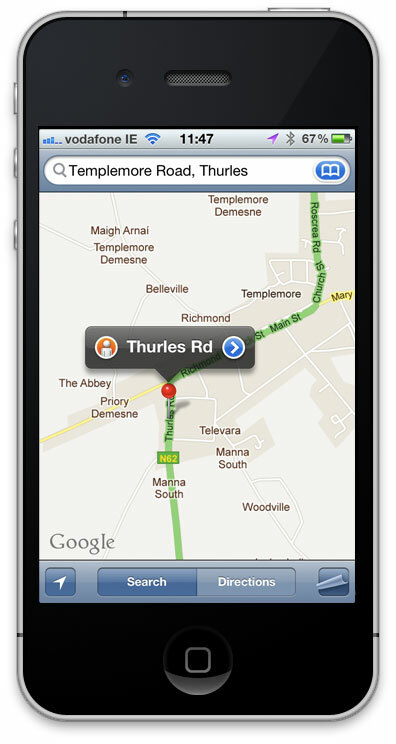 Asking Google to find the Templemore Road in Thurles proves even more elusive, when one of those red markers is firmly planted in the centre of the Thurles Road in Templemore (spot the difference of around 14 kilometers). OK, so I deploy some common sense and trace this road in the direction of Thurles, hoping that we will see the expected exchange between the name of the town and that of the road. No such luck. According to Google, when the N62 coming from Templemore reaches Thurles, it is called the Brittas Road — the Templemore Road simply does not exist, other than in local folklore, maybe. Or maybe Google’s got it wrong, horribile dictu. Eventually I had no other choice than to take a virtual trip on Google Streetview down the various Main and other Streets of county Tipperary — ultimately pinpointing all of the listed hardware stores. Happy days. This is not the first time I’ve struggled trying to find a precise location on Irish soil. Every other week or so, I may receive a text message from my daughter’s coach telling us that the next match is against Such-and-Such in Somebody’s Park. Invariably I have no clue as to how I might get to the relevant grounds, and rely once again on Google to help me out. A match in Hermitage Park landed a Google Maps marker in the middle of a housing estate in Rathfarnham. Alongside the “Park”, there’s a Drive, Court, Grove and a host of other examples of how to avoid using the word Street — but no sign of a sports field. Of course Google is blissfully unaware that locals (and GAA veterans) refer to the sports grounds in nearby St. Enda’s Park as, you’ve guessed it: Hermitage Park. None of this would be a problem if Ireland had post codes like the rest of Europe, or maybe even the Rest Of The World. Combined with a house number, the average post code will translate into a GPS-friendly point on the map that leaves little room for confusion — or maybe that’s just my utopian view. As it stands, Dublin is the only city in Ireland to use primitive postal districts, carving the city up in 22 chunks, with odd numbers for the northside, even for the south, and a lone alphanumeric 6W for the posh. On his website, a South Dublin solicitor states his address as “DX 225 002 Clonskeagh”. It’s a mystery where this cryptic pseudo-postcode comes from, but its progressiveness has to be admired. There are currently several unofficial postcode systems deployed in Ireland, such as GeoDirectory, GoCode and Loc8 Code — but these would be largely unfamiliar to the average punter, and the codes they produce don’t look anything like the one displayed by our solicitor. In fact, their codes appear to be shortcuts to geographic coordinates supplied by Google, and so my front garden would have a different code than my back garden. Playing with their iPhone apps, I discover that our office is in Dublin L66 CTF1 (GoCode) — or maybe that should be Dublin NS4-30-N13 (Loc8 Code). Either way, these codes point to our office in Citywest, and then tell us that it’s in Dublin 24, Co. Dublin, Ireland — compliments of Google. Over the past decade, there has been plenty of talk by various ministers about plans to introduce post codes in Ireland. It seems that this project has so far been assigned to the category of perpetual procrastination, along with electronic voting and the rail link to the airport. I’d hate to guess how many millions have already been spent on coming up with suggestions that the post code format should be “memorable” and “alpha-numeric”. For now, it seems that we will have to make do without postcodes for the forseeable future. 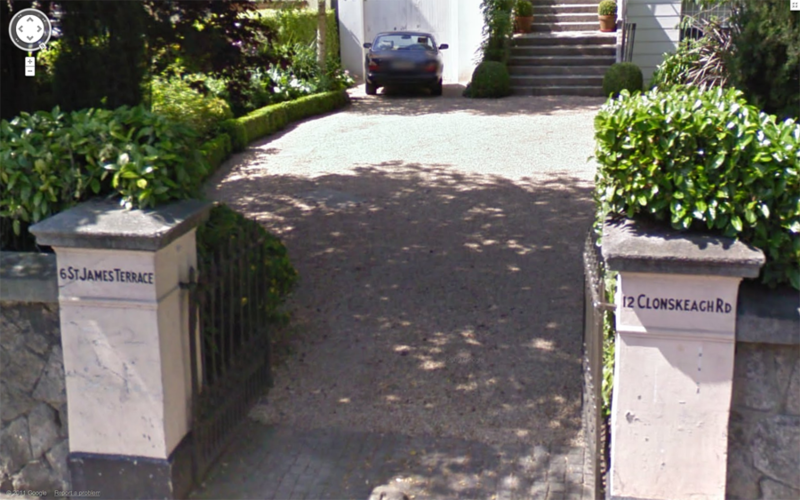 Finding addresses such as St. James’s Terrace in Clonskeagh will therefore remain a challenge when relying on Google, ending up in Dolphin’s Barn instead. Of course we can’t really blame Google when no. 2 St. James’s Terrace, Clonskeagh, is the exact same building as no. 4 Clonskeagh Road. So that’s St. James’s Terrace, Dublin 8. No wait, 6. It’s in Dublin, somewhere.